The two-time defending state champion Artesia High School Bulldog bowling team will play host to the annual Bulldog Bowling Invitational this weekend at the Artesia Lanes. Artesia bowlers will be competing at 9 a.m. and 1:15 p.m. Saturday. This year’s tournament features bowlers from Albuquerque High, Cibola, Cleveland, Del Norte, Deming, Eldorado, Grants, La Cueva, Las Cruces, Manzano, Rio Rancho, Volcano Vista, and the hometown Artesia Bulldogs, a total of 42 teams and 210 high school bowlers. Artesia coach Ken Clayton invites everyone to come cheer on the Bulldogs, as this is the one and only time each season the bowlers are able to complete at home and show off the work and effort they have put into their sport. “We have a highly successful program, and it is because of the commitment of these young people,” Clayton said. “This is an opportunity for our community to support that commitment while having a lot of fun doing it. In addition to the New Mexico High School Bowling Association tournament, the annual Dan Harvey Sr. Memorial Tournament will be held at 7 p.m. Friday at Artesia Lanes, with high school bowlers for around the state joining the AHS bowlers in a singles competition honoring the late Dan Harvey Sr., a mentor and friend to Clayton and father of assistant coach Tim Harvey. “The Dan Harvey Memorial has become one of the most popular tournaments for the high school bowlers in New Mexico high school bowling, and we would love to see a nice crowd to watch these kids bowl,” said Clayton. When each week you compete head to head with Rio Rancho and Cleveland, the two Class 6A bowling powerhouses in the state of New Mexico, you know you’d better bring your game. 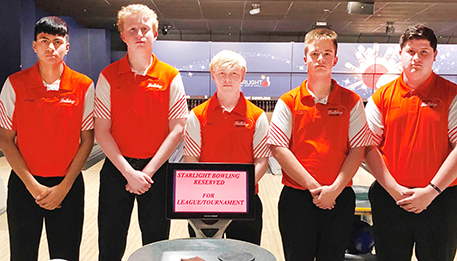 That is exactly what the Bulldog Advanced team did this past weekend at Starlight Lanes, where they finished second in the nine-team top division, surpassing Cleveland by 100 pins and falling an agonizing eight pins short of tournament winner Rio Rancho. The Bulldog top team was led by freshman Justin Weddige with games of 236 and 201, Ethan Velo, 219 and 181, Will Davis, 232, Coy Moorhead, 205, and Caden Brown, 190. Team games of 975 and 974 coupled with Baker games of 264, 228 and 203 allowed Artesia No. 1 to record this season’s high tournament score of 3,328. The Artesia No. 5 Novice division team of Logan McNeely (192), TJ Thalman (184), Wallace Smedley (175), Parker Johnson (164) and Ceaden Pearson (118) captured first place in the 26-team division, rolling a division-high 228 Baker game and winning the title by an amazing 206 pins. The win was Artesia’s third consecutive Novice Division win this season. Other leading bowlers at Starlight Lanes were Aaron Davis (192), Zach Ingram (192), Pecos Billips (201, 192), Kaitlyn Chesser (211), Ian Dodge (160, 157), Kaden Sallee (157), Ana Loza (134), and Emett Clark (145, 142). In the previous Silva Lanes Invitational, the Bulldog bowlers fielded two Advanced Division teams and placed third and fifth in the 10-team top division. Artesia No. 1 was led by Davis (212, 193), Moorhead (211, 182), Alex Harmon (201), Weddige (199) and Velo (193). Artesia No. 1 added strong Baker games of 236, 215, 208 and 202. Artesia No. 2 was paced by Brown (223, 187), Aaron Davis (222), Ingram (188) and Xavier Ybarra (184). The Artesia No. 5 Novice Division winning team was led by Joah James and his high game of 225, Thalman with 180, Smedley, 157, and Johnson, 142. Loza also added her career-high 177 game.